Or, just a good chili recipe. A long time ago, one of my very first bar regulars used to make me chili. It was de-frickin-licious, but he would never share the recipe with me. Wild Bill was a bit of a card, and what might be called a West Texas Renaissance Man. He played bass in the Lubbock Symphony Orchestra, and also worked selling tires and sometimes at the drive-thru beer barn known as Docs Liquor on the infamous Lubbock Strip. That was where we first met, and by the time I was slinging drinks at Hub City Brewery, he was already a great bar regular. He often came in for breakfast, hands a bit shaky, and he often had to be carried out the door. He never gave up his keys as he should have. He was sometimes overly forward with the waitresses. He had a wealth of dirty jokes and a neatly trimmed silver goatee. He wore his silvery hair long and dashing, and dressed well when he could. He had a beer named after him at the bar, Wild Bill’s Yellowhouse Wheat, and it was our best seller. He was a steadfast if not perfect friend, and he is missed. Here, as I have very nearly perfected it, is a tasty treat. It is not actually Mr. William “Wild Bill Perkins’ chili recipe (to my knowledge, it died with Bill more than 8 years ago), but one of my own concoction over years of effort. However, my recipe includes, and at last makes public for the (not even remotely) first time, Mr. Perkins (may his soul rest in inebriated peace) long lost Secret Ingredient. Hint: It’s beer. 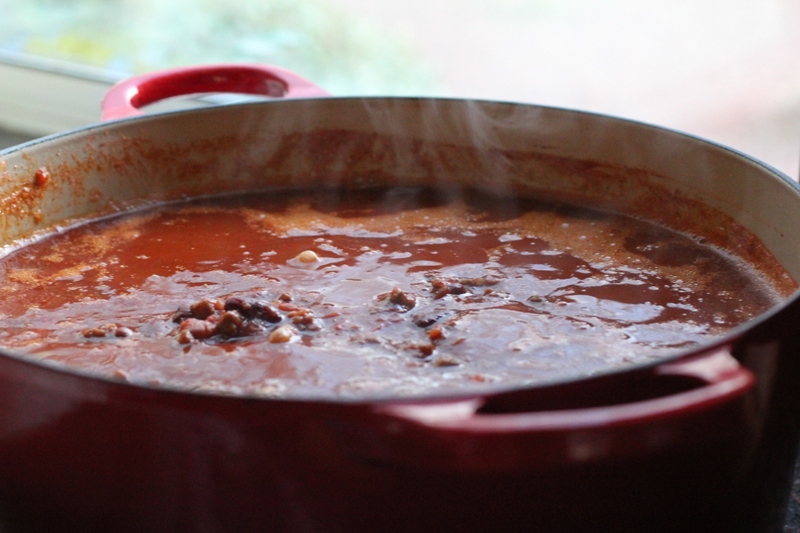 Try it, and if you like this true Texas chili, then wonderful! If not, you may go to Hell. Say hi to Wild Bill when you get there. 1/2 a can (or bottle if you must) of Coors Original Banquet Beer. Swig some of the can after pouring, and pour a little out for ol’ Wild Bill. In a heavy pan, brown the ground beef, then set aside and drain all (or at least most of) the fat. In a large stew pot, add the rest of the ingredients, then stir in the ground beef. Bring to a boil, then reduce heat to med-low and simmer for about an hour. Serve with Saltine crackers or over hot dogs with your choice of cheese, fresh onion or jalepeno toppings. Also works well on Fritos. Special thanks also goes out to the folks at Eskimo Joe’s in Stillwater, Oklahoma for insight and a good start on this, long ago. Sounds delicious. Hope you're well, Cloudwrangler. You should write. thanks jefe. miss you, bill. Previous Previous post: On the More things Change, the More I stay the Same.